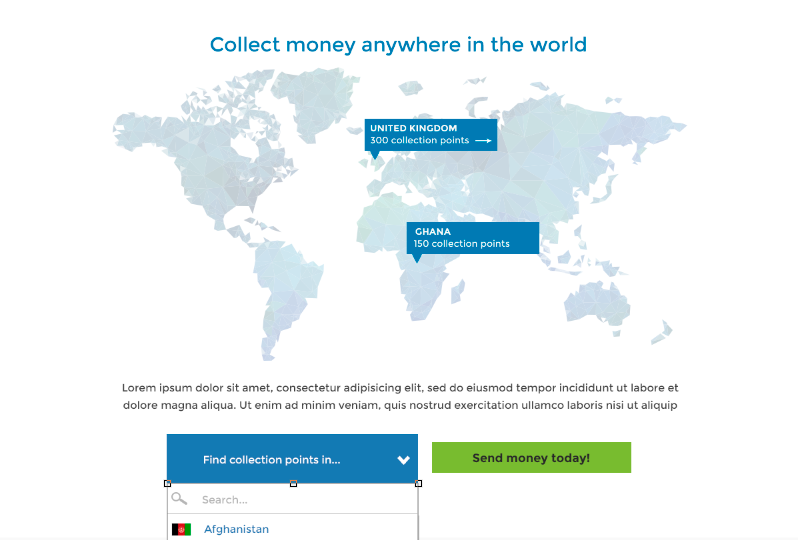 The expectation is that the user would drill in at a country level to find where collection points are, starting at a per a country basis, highlighted below. Alternately, the user, if satisfied that the map fulfils their research requirements, can begin the conversion journey via the CTA. The client has also asked for us to produce another design for the map if this isn’t going to work on mobile, what are we going to use instead? From Wikipedia: Semiotics is the study of meaning-making, the study of sign processes and meaningful communication. On this one, go back to the client and say our thoughts would be it’s just going to be a static map image which we either keep there or we remove it. We do not replace with another animated widget. I’m on mobile, as a user, I’m less likely to care about presentational fluff. I just want to get to the button to see where i can do stuff and see it easily. Because of the cramped and linear presentational nature of mobile a benefit of keeping the static image would be it provides a nicer clearer transition into the section. To that end, notice that I reordered the image and copy order at mobile level to help create that transition. An image of the map provides a instant vital level of semiotic context for the user i.e. we are indicating coverage of the whole world, not just coverage of Europe, or just Britain. it’s a just little less to do in terms of data to pull back if it’s coming off the api which is always a good consideration for users who could be browsing on a mobile network, may be on 3G blah blah. Probably some minimal general on-page performance increase if the cpu isn’t wasting time animating something for which provides no real user benefit. TL;DR Fast users are happy users. Happy users convert. Adding in another alternative animated widget we could do…. but… I struggle to think of a compelling widget that provides greater context, quickly, for the user. It’s not like the money ticker widget, which serves an important purpose in getting the primary conversion relevant information in front of the user. The animated map widget, which does provide a trust signal as a secondary level of information, is still really more a presentational element for desktop and tablet users where we have the presentational space and users tend to dwell. This is because, as mentioned earlier, the static map and copy already provides the worldwide context. Now I as a user just want to drill into that information. 300 locations in X country is still a needle in a haystack effectively in terms of letting me know that I can get my cash to, say, little Timmy who is currently being held hostage in Thailand by pirates. So… I’d test it. Because it’s be interesting to know what works best (but I’d be testing the transfer calculator first). Failing that I’d just keep it, (obviously I guess? otherwise I wouldn’t have put it there in the first place?). The benefits, to me, also make a compelling argument to keep it. But otherwise my suggestion is to bin it and go straight to copy.